Manager Masao SASAKI (70), who is arguably a greatest living skipper of Japanese Collegiate Baseball, will retire at the end of March, 2019 after 35 years with Yokohama College of Commerce Baseball Club. 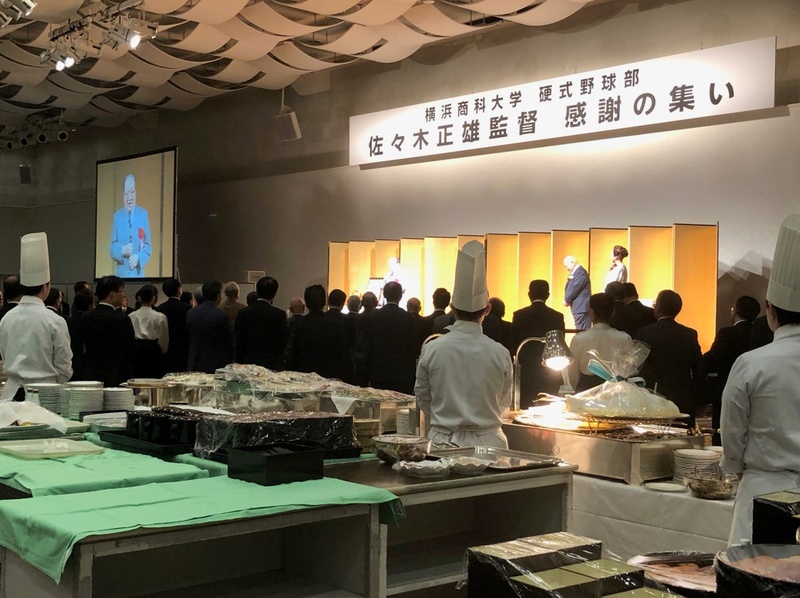 On January 20, 1,200 friends joined Yukio FUJIKI (87), Sadaharu OH (78), legendary former Tokyo Yomiuri Giants great who slugged 868 carrier home runs, at Yokohama Prince Hotel to pay respect to Sasaki for his remarkable leadership to have fostered a large number of professional and amateur players by placing emphasis on human development. SASAKI thanked the guests by saying “Players will follow such a leader who does not dodge an issue. Now I can finally take the load off my shoulders!” He remains as a Technical Development Committee member of the Japanese Olympic Committee and will serve as General Director of Yokohama College Baseball Club after April 1.